I have a beautiful blue feather that was calling out to me when the topic was chosen. I have been playing with Inktense pencils so I drew the feather on freezer paper backed fabric and colored it in with the pencils. I used fabric medium to wet the pencil marks and the colors came to life. 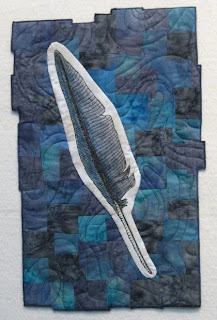 Then I freehand quilted the feather and appliqued it to a fused collage background. I like weird outside edges and I love the technique of zig-zagging a binding. It all came together very quickly and I am happy with the results. Here you can see the blending of colors from the pencils and the quilting. 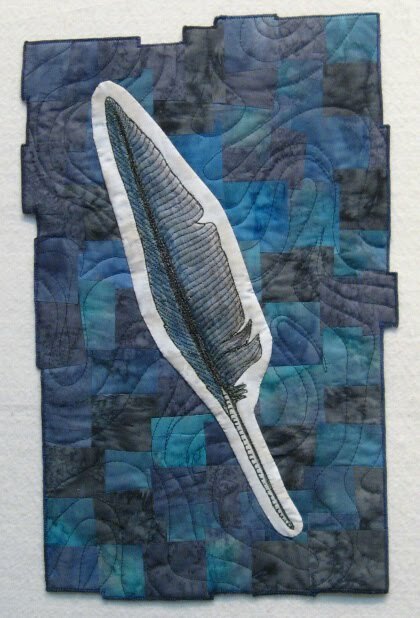 That IS a very nice feather, and I like your raw-edge collage background and irregular edges. Neat! Great choices...background color, uneven edges. I didn't read about the piece during my first 2 times of looking at it, without knowing the color I sensed it was blue...your choice of backgroung color. The edges of a feather are not even...the uneven edges emphasis that. Did you know that you don't have to use fabric medium with Inktense pencils? They are permanent once dry (plain water) and even machine washable at that point. I love the mystery of the background you decided to use. It fits with your theme and the beautifully done feather. Karen, I like the blue/gray color mix and the edge! 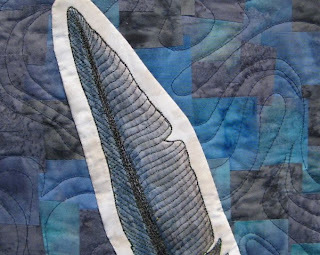 You did a great job drawing and stitching the feather.